I used to teach first grade and I've kept in contact with a lot of my former students. One of my sweet families has recently made some dietary changes due to health reasons, and the mom asked if I had any healthy snack ideas that were low glycemic index. "The Glycemic Index is a numerical Index that ranks carbohydrates based on their rate of glycemic response (i.e. their conversion to glucose/sugar within the human body)." 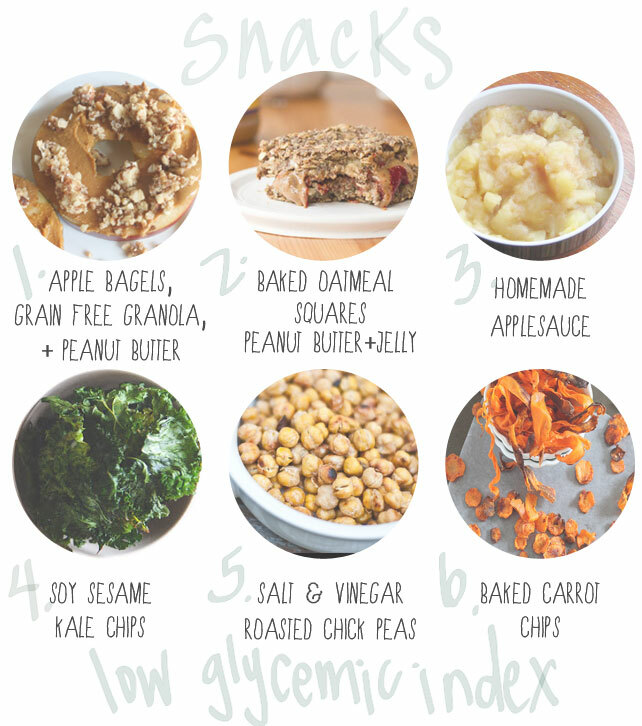 This week I'm rounding up a bunch of low glycemic index snacks geared towards kiddos (but good for adults too)! Low glycemic index foods help your blood sugar to stay stable. "Your body performs best when your blood sugar is kept relatively constant. If your blood sugar drops too low, you become lethargic and/or experience increased hunger. And if it goes too high, your brain signals your pancreas to secrete more insulin. Insulin brings your blood sugar back down, but primarily by converting the excess sugar to stored fat."via. 1// Apple "Bagels": I've been meaning to post about these but haven't gotten to it yet. All you do is core an apple (we have this corer) slice it lengthwise to get the "bagel" then add peanut butter and whatever toppings you like (coconut, granola, strawberries...). In the above picture I used grain-free granola that I made with our dehydrator. Some other apple sandwich ideas: here, here & here. 2// Basic Oatmeal Squares: I've made different variations of baked oatmeal and always love the convenience of having it on hand and ready to go. Occasionally, I cut it into squares and wrap it in plastic wrap for a quick on-the-go breakfast during the school year. 3// Sweet Homemade Apple Sauce: There are SO many good recipes available for homemade apple sauce. I've used the slow cooker before and the stove top. You can eat it warm or cold. A dash of cinnamon and you've got a healthy sweet treat, no added sugar needed. 4// Soy Sesame Kale Chips: I usually put garlic salt on my kale chips, but the soy sauce, sesame oil & sesame seeds in this recipe sound like really good additions. "It’s Asian- (and nori-) inspired, and takes about 10 minutes to throw together." 5// Easy Salt & Vinegar Roasted Chick Peas: I've made these before and they are delicious! I've also made honey+cinnamon roasted chick peas. I'd definitely recommend both. They're nice and crunchy (sweet or salty) with a good amount of protein. 6// Baked Carrot Chips: This looks like an easy recipe with only a few ingredients. We like to make carrot "fries", but these carrot chips would be a perfect snack to take with you running errands or to add to your lunchbox.